Volunteers band together to plant seeds of hope in Lowell. Photos and video by Tory Germann. For decades, the vacant trash-filled lot sat alongside a notorious Smith Street tenement house. Back in 1993, the apartment building served as a safe place for junkies and addicts to hang out and get high, including former pro boxer Dicky Eklund. In the Lowell-based boxing drama The Fighter (nominated for seven Academy Awards including best picture), a cracked-out Eklund played by actor Christian Bale jumps out a back window of the Smith Street house — the actual house was used in the film — and lands in a dumpster. Now the building houses families and the sad little lot next door is getting an extreme makeover. Armed with shovels and community pride, Mill City Grows is transforming another neglected parcel in a neighborhood synonymous with crime. Students from the Lowell Community Public Charter School, volunteers from several grassroots organizations, neighbors like Carlos Vargas, 10 and Jayden Huertas, 8, who started the day watching from their front stoops — all worked together on a bright blue Saturday morning, clearing overgrown brush and trash from the lot at 36 Smith St. to prepare for planting a public garden in the spring. “A strip of flowers goes a long way,” said Evan Horn, a member on the Board of Directors for the Cambodian Mutual Assistance Association, an organization committed to bettering its lower highlands neighborhood. Many of the volunteers credit Francey Slater and Lydia Sisson of Mill City Grows for the movement afoot in Lowell: Pride in community, one garden at a time. Mill City Grows offers a heartening counterweight to the Great Recession’s foreclosure and unemployment epidemic. “What greater underdog story can you find than a gardener trying to coax food from asphalt?” asked Gloria Deschesneaux, who owns the Smith Street tenement house. Food, she adds, regardless of race, religion, ethnicity or income, is also a powerful social connector. 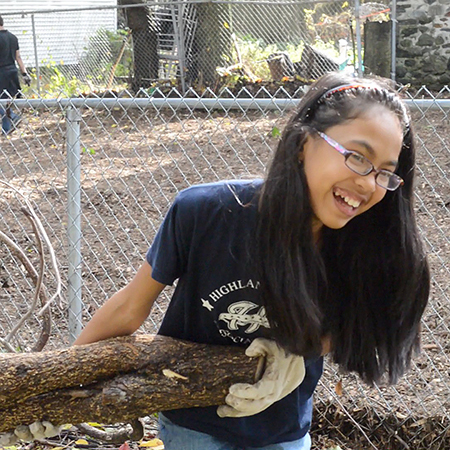 Students from the Lowell Community Public Charter School help clean up. Photo by Tory Germann. The first Mill City Grows community garden blossomed in 2012 off Richmond Avenue, in a former blighted lot in the Back Central neighborhood of Lowell. The patchwork of 40 raised garden beds filled city-owned land that had previously been an improvised trash dump and ground zero for the area’s drug trade. Since the garden took root in the spring, neighbors say they feel better about the area. “The change they’re creating is not just about the garden, but about the gardeners,” said Kathleen Marcin, president of the Lowell Downtown Neighborhood Association. Expect more gardens to sprout up next year and in the years that follow, Sisson said, as Mill City Grows plans to promote healthy living and urban gardening throughout Lowell. From Michelle Obama’s garden on the White House south lawn to new laws being passed in densely populated cities like Somerville that allow backyard chickens and establish rules and guidelines for urban farming, Sisson said Lowell is just another step in a nationwide push for community agriculture. The Lowell Alliance for Families & Neighborhoods also helped in the Smith Street clean-up. Learn more about Mill City grows here.